Delhi Police Recruitment Board chuan DIG (Hqrs) PHQ, Aizawl kaltlangin Delhi Police Constable (Executive) Mipa - 44 leh Hmeichhia - 21 lakna tur Dt 26./9/2018 atanga Dt 25/10/2018 chhung hian an buaipui dawn a. Dilna form hi Mizoram police website, police.mizoram.gov.in atanga download theih a ni a, hrechiang duh tan SP Office, Lunglei ah office hun chhungin zawhfiah theih a ni. 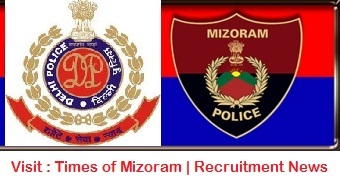 Applications are invited from Indian Nationals from all parts of Mizoram to fill up the vacancies of 44 posts of Constables (Executive) Male and 21 Constables (Executive) Female in Delhi Police in the pay scale of PB-1 Rs. 5200-20200/-+Grade Pay Rs. 2000/- (Revised Pay Scale after 7th CPC Pay Matrix Level-03) and other allowances as admissible. Recruitment will be held at Aizawl for which candidates from all parts of Mizoram, fulfilling the conditions mentioned here under can apply. Note – a) Only the natives of Mizoram are eligible to apply. b) The number of vacancies is indicative and may undergo change anytime before declaration of result. CLOSING DATE The last date of receipt of application form will be 25.10.2018 till 5 PM Applications received thereafter will not be entertained. 1) Bandsmen, buglers, mounted constable, drivers, dispatch riders, etc of Delhi Police Only. 2) Sons of serving, deceased, retired police personnel including Multi Tasking Staff (formerly category ‘D’ employees) of Delhi Police. Age : Age for the post of Constable (Exe.) Male is from 18 to 21 years as on 01.07.2018, i.e., those born not earlier than 02.07.1997 and not later than 01.7.2000 will be eligible and age for Constable (Exe.) Female is from 18 to 25 years as on 01.07.2018, i.e., those born not earlier than 02.07.1993 and not later than 01.7.2000 will be eligible. Upper age limit is relaxable for 5 years for candidates belongings to SC/ST as per rules. ii. For Female: Height Minimum 155 cms. Application forms can be obtained (free of cost) in anyone of the following ways :  Typed/Photocopied application form on A4 size paper, as per format published in the news-papers or on the website of Mizoram Police on www.police.mizoram.gov.in  Downloadable application form available on the website of Mizoram www.police.mizoram.gov.in  Employment exchanges in all the Districts in Mizoram.